Most commonly caused from motor vehicle accidents, whiplash occurs when your neck is suddenly whipped backward and forward. The problem with whiplash though is that you may not start to present injury symptoms immediately. If you’ve been in a car accident, you should make sure you consult a medical specialist, document your accident and speak to a legal professional such as Patinos Personal Lawyers in case you need to make a claim. In the meantime, being aware of your body and looking after yourself is the best form of medicine! Below are some other ways to treat whiplash after a car accident. The best form of treatment for any injury is having a complete understanding of it. If you understand your injury you’ll know how to look after it. 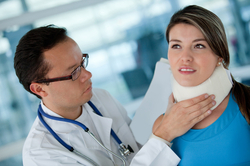 The extent of damage caused by a whiplash injury can only be discovered via a proper medical assessment. Depending on the damage to the spine for example, it might not be necessary for you to wear a cervical collar. Although it might not be a life threatening injury, whiplash can still have symptoms from a short-term ache to prolonged and recurrent pain. Assess it, define it, and then work with it to get better. As more research is done on whiplash injuries, it is now more commonly recommended not to become completely immobile. Halting all movement to the area could actually slow your recovery. Rotational exercises of the area have been suggested to avoid further stiffness and pain, as well as muscle wasting from lack of movement – you want to build up strength and flexibility in the area again. Make sure not to overdo it though! You don’t want to end up making the injury worse all because you want to get moving again faster. Both physical and occupational therapy are great suggestions if your injury is quite severe and you don’t feel comfortable enough moving through exercises on your own. They will help you not only feel better to cope with everyday life tasks again, but will also help you adapt back into your workplace environment. If the injury is severe it can take a psychological toll on your body. Talking through these feelings with a professional might help ease some of the mental burden of the accident and get you feeling better both inside and out. You shouldn’t have to deal with daily pain, so as you’re working through your injury with exercises, have your doctor prescribe you some medicine to help as well. Painkillers and muscle relaxants will assist with muscle spasms as well as the direct pain in your neck. An ice or heat pack applied to the area at different intervals could also help with any inflammation. It’s important to remember that no matter how severe or minor your whiplash injury might be, without proper medical attention it could very easily turn into a chronic condition. If you’re in a car accident – no matter how small – get checked out immediately rather than just shrugging it off as nothing. The sooner you get treatment, the sooner you’ll be back on the road to recovery. What has been the worst experience of whiplash either you or someone you know has experienced? Leave your answers in the space below.